Welcome to the worlds greatest guide to Maternity Dress. Are you actually looking for Maternity Dress? Well, we hope you are because the reality is that you have found our Maternity Dress page. 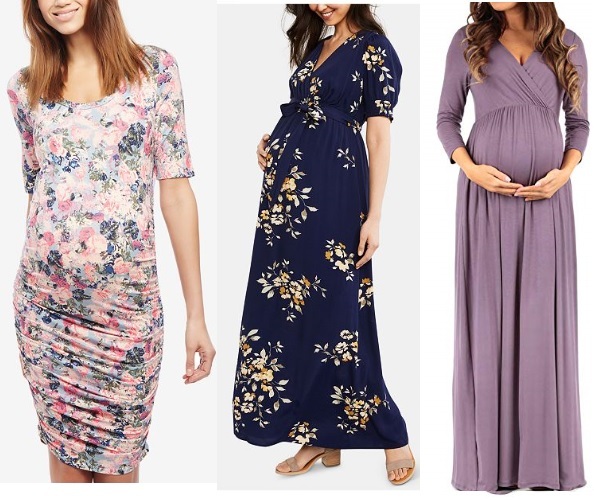 In this women's clothing section of the Apparel Search directory, you will find all sorts of interesting information regarding Maternity Dresses. Apparel Search is a leading guide to fashion, style, clothing, glam and all things relevant to apparel. We hope that you find this Maternity Dress page to be helpful. Pregnancy causes growth in the body and therefore typically requires special clothing. It may be time for a new dress. As the body is changing shape and therefore levels of comfort, most maternity clothing is made with Lycra, elastic and other stretch materials to provide for fabric stretch for body growth & comfort. A dress is a garment consisting of a skirt with an attached bodice (or a matching bodice giving the effect of a one-piece garment). It consists of a top piece that covers the torso and hangs down over the legs. A dress can be any one-piece garment containing a skirt of any length. Maternity dresses can be formal or informal. Choose between beautiful floral designs, plain colors perfect for day-to-day wear, and ever thing else in between. You can find a wide assortment of maternity dress styles in the retail market. Look for stretchy and durable fabrics. If you want to be even more stylish, you should wear your favorite maternity dress.